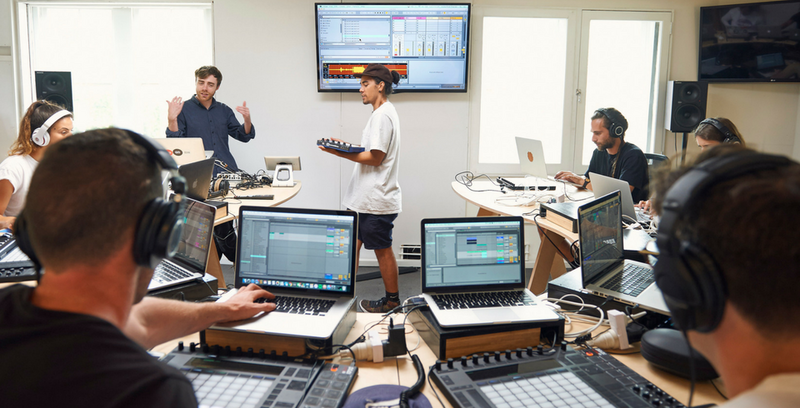 Learn to produce music at Australia’s leading Ableton Certified training centre. This intensive stream teaches our flagship Produce Music program over 6 weeks of full time study. Produce Music is a highly acclaimed electronic music production course developed by Grammy Award-winning artists, Ableton Certified Trainers and producers of iTunes and Beatport chart-topping tracks. Students leave with a thorough mastery of the Ableton Live software, a complete music production skill set, a portfolio of completed projects and everything they need to effectively produce release-ready music for themselves and others. Save 40% on Ableton Live when you enrol at Liveschool. Being an intensive course it is a requirement that you are fluent in English (spoken and reading), have your own computer to work with and are highly capable with computer applications in general. If you are an absolute beginner in music or music production, or are unsure about the other requirements, please contact us to discuss eligibility prior to enrolling. All class and studio sessions are weekday daytimes. Contact us today to request the Produce Music Intensive schedule or a detailed syllabus. By the end of this program you will have what you need for a creative portfolio and electronic press kit including original tracks, remixes and edits, soundtrack and video work , promo mixes, and more. Produce Music Summer Intensive is a fast-tracked version of our year long Produce Music course. The course will run over 8 weeks from 26 Nov 2018 – 18 Jan 2019, including a 2 week break over the Christmas period. Being an intensive course it is a requirement that you are fluent in English (spoken and reading), have your own computer to work with and are highly capable with computer applications in general. If you are an absolute beginner in music or music production, or are unsure about the other requirements, please contact us to discuss eligibility prior to enrolment. Harley Streten / Michael Di Francesco / Elizabeth Rose / Yama Indra / George Nicholas / Adam Maggs / Anthony Garvin / Mitch Kenny / Francis Xavier / Sameer Sengupta / Thomas McAlister. You need to comfortable with day-to-day computer skills (navigation, opening, saving, etc), everything else you need to know will be covered on the job. Do I need to buy anything before I start the course? It is recommended you own a copy of Ableton Live to successfully complete this course. A Free 30 Day license of Ableton Live is available for first time users. During the course you are given creative projects to work on. These help you put your learning into action, while progressing your skills at a comfortable pace. If any of your productions aren’t complete by the due date, there is no penalty – the projects are about creativity and production quality. If you are falling behind for any reason, we can provide one-to-one training to help catch you back up. After booking your course you are responsible for attending all dates and we do not refund, nor accept any liability for your loss of course time. Sorry, but that’s the trade-off for the small class sizes. Alternatively, you are able to transfer your booking to another date or course if you contact us one month before the course begins. This gives us enough time to fairly try and fill the seat. 50% module booking. We offer a 50% re-sit discount to students wishing to re-take a complete module for further immersion. The 50% applies to complete modules regardless of how many sessions you retake, and for 2 or more sessions it is often more cost-effective to do this. Private tuition session. Please contact us for dates, times and pricing. We do not offer instalment plans for Produce Music Intensive.